1. A tank or cylinder equipped with a main shutoff valve. 2. One or more regulators designed to reduce pressure between the container and your appliance(s). The tank or cylinder is where the propane is stored. It is equipped with a shutoff valve, which turns the gas “on” or “off”. The regulator controls the gas pressure, while the gas piping carries the gas to your appliance(s). It is important for you to know the location of the main shutoff valve on the tank or cylinder. 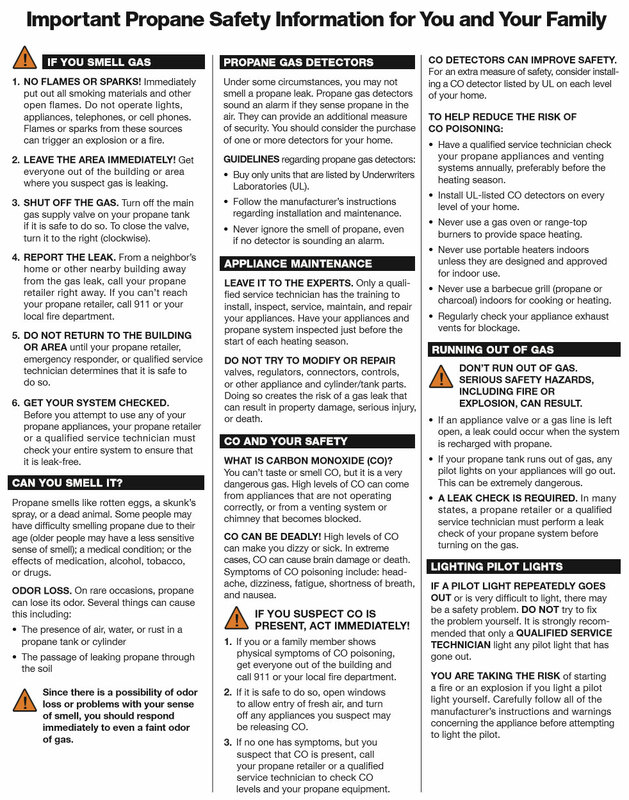 Remember its location and become familiar with how to shut ir off in an emergency situation. 1. Turn off all control valves on all gas appliances. 2. 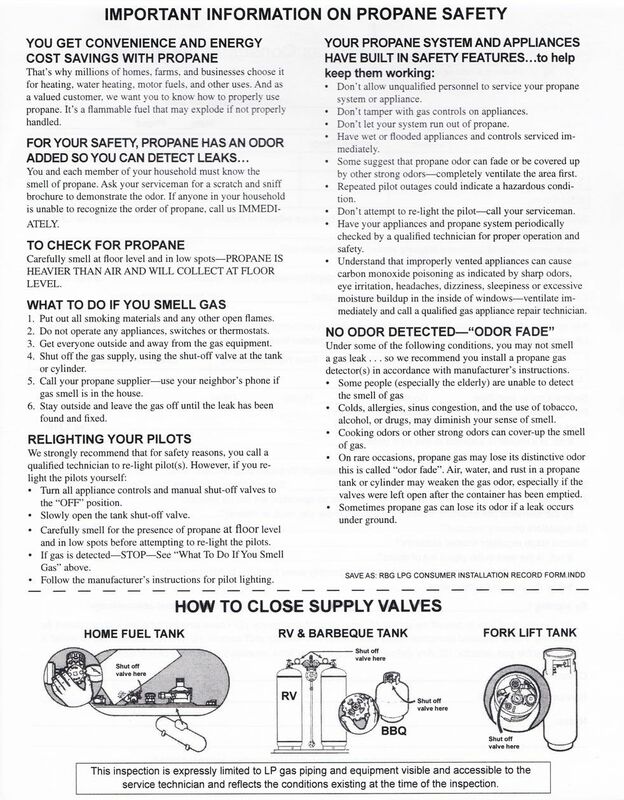 Turn off the shutoff valve on the propane container(s). 3. Call Reliance at 419.473.1374 to arrange for delivery, and advise them you are out of gas. 4. Don’t turn the gas back on! Let Reliance do it. When you schedule your fill, be sure it is for a time when you will be home so Reliance can relight and safety-check your system to assure that it is operating properly and is leak free. Residential heating systems need regular tune-ups. Contact Reliance Energy at 419.473.1374 to inquire about a home-heating system inspection program. Change your furnace filter monthly. Clean filters will save you money on your heating bill. Consider investing in a furnace thermostat timer that can save money by lowering your home’s temperature when you are not home. Protect against drafts around windows and doors by caulking and weather-stripping. If you are purchasing a fireplace, consider selecting on fueld by propane. Propane fireplaces burn more efficiently than wood burning models and distribute heat more evenly throughout the room. You can save more that 10 percent on your water-heating bill by turning down your water heater from the standard 140 degrees to 130 degrees. To extend your water heater’s life and increase energy efficiency, drain it every six months to remove lime deposits and sediment. Install flow-restricting shower heads. You can reduce hot water usage by up to 50 percent without affecting shower pressure. Gas ranges with electronic ignition systems will use 40 percent less energy than a standing pilot system. Be sure that all burners are burning with a blue, cone-shaped flame. A yellow flame indicates clogged air inlets or burners that need adjustment. Contact Reliance Energy’s service department immediately at 419.473.1374 if you do not see a blue flame. Check the seal on your oven door. Gaps or tears in the seal will let heat escape and waste energy.